Yes, please send me the following quantity of The Beekeeper. If mailing address is to CANADA or the USA, I'll pay C$15.95 per copy.. If mailing address is OVERSEAS, I'll pay US$14.95 per copy. Unit prices above include 50% discount, applicable taxes, shipping and handling. Young, impressionable, twenty-year-old Walter Taylor flees his suburban home in search of freedom and adventure and stumbles into more than he bargained for. 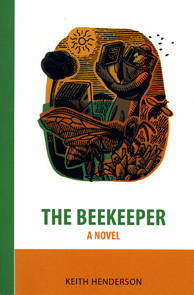 Set in a chaotic bee-farm at the height of the 1960s, home to a bohemian, European-born artist and his mistresses, The Beekeeper is filled with allusion, irony, and high humour, yet sets in stark relief the fund of violence and ignorance that underlay the romantic dreams of the 1960s. Henderson has written a hilarious satirical portrait of the last generation’s counter-culture movement, as well as an original and thought-provoking assessment that what produced this rebellion was to a large measure, transplanted European ideas originating not only in the last century but beyond. Keith Henderson has published two other novels, (The Restoration, DC Books 1994 and The Roof Walkers, DC Books 2013), a collection of political essays from when he was Quebec columnist for the Financial Post (Staying Canadian, DC Books, 1997), as well as a prize-winning book of short stories (The Pagan Nuptials of Julia, DC Books 2006). He led a small provincial political party in Quebec during the separatist referendum of 1995 and championed English language rights and the “poison pill” strategy of partitioning Quebec if ever Quebec partitioned Canada, positions covered in full length articles in the Los Angeles and New York Times as well as on CBS 60 Minutes. * This book is “perfect bound” with an add-on hard cover, no dust jacket. List prices above do NOT include applicable taxes. Offer prices to the left DO!